The APBF Positive Pit Care School Program is geared towards teaching compassionate canine care to high school students. The eleven week class involves hands-on learning with Therapy certified Pit Bulls, canine demonstrations, a field trip, positive rewards for participation, visual aids, interactive learning games, and more. 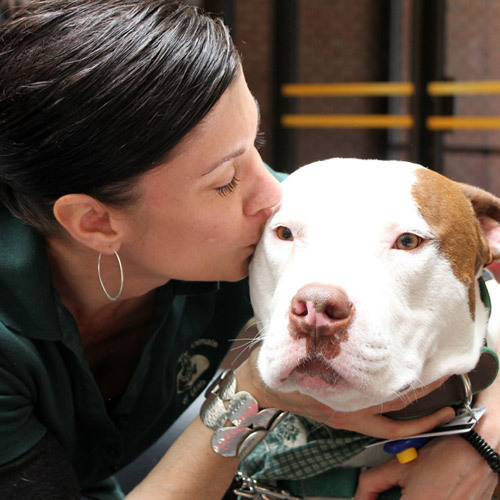 The purpose of the Positive Pit Care School Program is to identify areas of educational need and provide the vehicle to fulfill those needs, in regards to compassionate canine care. Our youth hold the key to the future with companion animals. It is our goal to lead them in a way that provides a solid platform for them to make their own educated decisions in regards to providing a healthy, compassionate, non-discriminatory environment for companion animals. Over 22 veterans a day are lost to suicide, which is now the leading cause of death in the military, surpassing war. Over 4,000 Pit Bulls are killed every day. APBF is the first organization to bridge the gap and exclusively train rescued pit bulls as service dogs to help our veterans overcome the daily struggle of PTSD and depression.